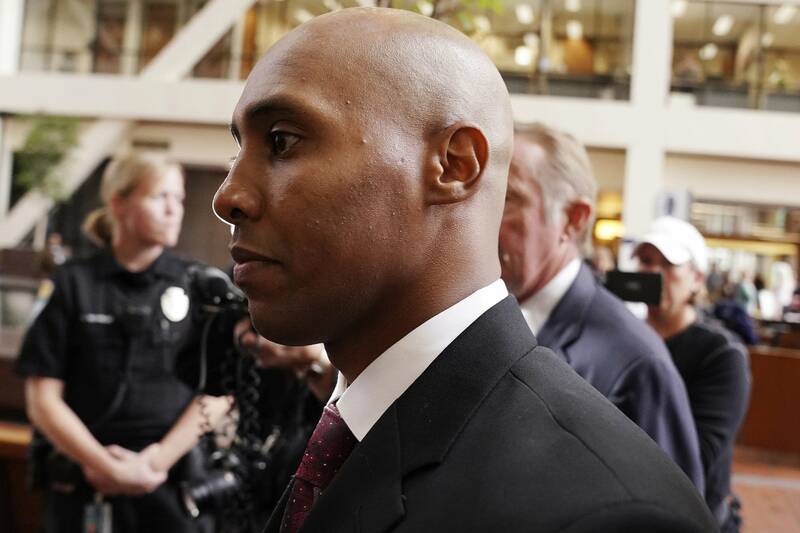 Three days after former Minneapolis police officer Mohamed Noor was discharged from the department and charged with murder, he paid $90 and renewed his Minnesota state policing license. The March 23, 2018 renewal came about three months before the license was set to lapse. Renewing it kept him eligible to serve as a police officer in the state until 2021, according to the Minnesota Board of Peace Officer Standards and Training. Although Noor would need a job with a police department to make the license active, he can renew it indefinitely as long as he has 48 credits of continuing education in law enforcement every three years and is not convicted of a felony. Noor is charged in Hennepin County District Court with second-degree murder, third-degree murder, and second-degree manslaughter in the shooting death of Justine Ruszczyk in July 2017. Ruszczyk was shot and killed by Noor in the alley behind her home after calling 911 to report what she thought was the sound of a woman being assaulted. A pretrial hearing is set for Friday. Noor's trial is scheduled for April. Noor, 33, was hired through the department's cadet program on March 23, 2015. The program requires cadets to pass the peace officer board's licensing exam after successfully finishing the academy and before its final end date. According to his personnel file, Noor passed the exam on Aug. 28, 2015. His license was valid for three years. Noor was on paid administrative leave after the shooting for eight months, until prosecutors filed charges on March 20, 2018. Minneapolis Police Chief Medaria Arradondo said then he waited to make an employment decision during the ongoing investigation and decided to end Noor's employment the day charges were filed. Licenses remain valid and inactive until an officer gets hired by an agency, said Nathan Gove, executive director of the peace officer board. "In an inactive status, they don't have any law enforcement powers. It doesn't grant them the ability to carry a firearm or anything like that," Gove said. "They're just maintaining their license, especially if they ever decide to get back into the law enforcement profession." The board doesn't have authority to pull licenses once they are already licensed police officers in cases that involve misdemeanor convictions. Gove said the board is looking to expand its authority to act against licensed officers convicted of crimes such as domestic assault. The change would still only allow the board to take action in cases where the officer had been convicted. It is possible Noor renewed his license to keep his options open in case of a not-guilty verdict, said Michael Quinn, a retired sergeant and former head of the Minneapolis Police Academy. "Certainly his conduct would be the first thing you'd look at, especially the person that's hiring him, because you're looking at potential liability," Quinn said. "Why would anybody take him? But in fact, there are agencies that do that." The only other Minnesota police officer to go to trial for an on-duty shooting is former St. Anthony police officer Jeronimo Yanez, who shot Philando Castile at a traffic stop in 2016. A year later, a Ramsey County jury acquitted Yanez of manslaughter and felony weapons charges. According to the peace officer board, Yanez's license is valid until June 2020, although he has not been hired again as an officer by any Minnesota law enforcement agency.